Published: Feb 2017 i Previous editions(s) can be found in the Related Items tab. Importing commercial goods into the United States involves complying with the many complex regulations administered by U.S. Customs and Border Protection. International Trade Law Answer Book provides a comprehensive and step-by-step overview of the current law regulating when and where, and if, goods can be brought into the United States. International Trade Law Answer Book walks you through the entire importation procedure, describing each step in the process; the regulatory requirements governing that step; and providing a copy of each major form that must be completed, including instructions on where and when that form must be submitted. In addition, this new title provides complete coverage of how Rulings are issued and how to handle a negative Customs response, including the filing of protests and, ultimately, review by the U.S. Court of International Trade and the U.S. Court of Appeals for the Federal Circuit. 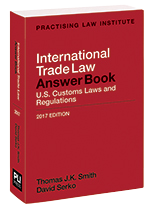 International Trade Law Answer Book is designed to assist importers, attorneys, customs brokers, accountants, freight forwarders, customs consultants, Customs professionals in government service, and students in finding answers to the technical legal and administrative practice questions that inevitably arise in connection with importing merchandise into the United States. David Serko wrote the first and second editions of Import Practice: Customs and International Trade Law, the predecessor to Import Practice Answer Book. He received his B.A. from Syracuse University in 1952 and then while working full time as a clerk for customs and international trade law firms, received his LL.B. from New York University School of Law in 1956. Beginning in 1957, he practiced customs and international trade law exclusively for forty-five years until retiring in 2002 as senior partner of Serko & Simon LLP, the law firm he founded. Mr. Serko lectured extensively in the United States and abroad on many topics in customs and international trade law and practice, was a director or chair of various committees of customs and import organizations, and was Legal Editor of Global Trade Executive magazine. He currently serves as an arbitrator for the Financial Industry Regulatory Authority.